When I travel I love to take photos and to write about my travels. This blog is as much for me as it is for other people to read – maybe more so. Writing helps me to give things some perspective, and, well, my life’s worth writing about … mostly. My life that is – not me personally. I’m pretty ordinary, but I do (mostly) have an extraordinary life. Of course, it’s interspersed with the boring bits where I have to earn money, but I’m working on that too. I might have a new business venture to announce soon. So, if you want to take photos and write during your travels, what are the things you need to make sure you have with you? Anyway, the camera charger wasn’t in its place. I pulled everything out looking for it. Everything from behind and under the seats. Everything out of my bag. Everything out of my camera bag. It wasn’t anywhere. I thought and thought about where I had it last. And then I remembered – on my cupboard at home. Where I looked at it and thought to myself “don’t leave that there, or you’ll forget it”. I guess I did, so I did! Not that it really would have mattered anyway, because my inverter broke so I couldn’t charge anything that needed plugging in. Like my camera battery. Not only couldn’t I take any photos, I couldn’t write about my adventures. 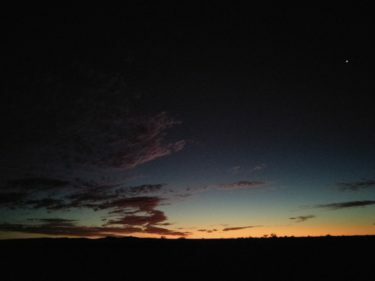 I could try to stay at places where I could access power, but as I was heading towards the desert I’m not sure where, other than Oodnadatta, that might be. And I’m going to confess to an unpopular opinion here – I don’t like the Pink Roadhouse. 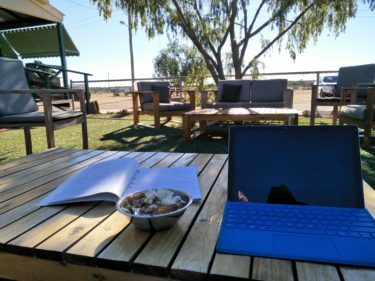 The Pink Roadhouse in Oodnadatta is one of those places that came with high expectations, but which didn’t live up to them. I had heard so much about it that when I pulled up the first time I was quite excited. Then I saw the line for fuel. Fortunately my car is petrol, so even when there’s a big line I don’t normally have to wait because everybody else wants diesel. I refuelled, and walked into …. does anybody remember Coles Cafeteria? Or am I showing my age??? Well, it was a bit like that. A big cafeteria and general store. Big, crowded, noisy. With backpackers who didn’t know much about the area working there (more about that in another blog). 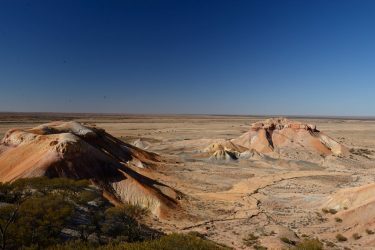 It was probably an amazing place when the Oodnadatta Track was much less travelled, and when it took a lot more effort to get there. But now, when everybody and their dog (lots of dogs) drives the Oodnadatta Track, the Pink Roadhouse is almost a Westfields! But this time I contemplated staying there. I tried to talk myself into it so I could use the power. I stopped and had a burger. Then I walked around Oodnadatta and visited the museum (well worth a look for an hour or two). I had a drink at the pub, and got supplies from the other shop. I tried to convince myself that I should stay there. But I just couldn’t do it. I decided to keep driving up the track. About 100k further along I came to Kathleen Creek. How could I pass up camping there? It was a beautiful spot, and I had plenty of time to collect firewood and watch the sunset. And without a camera or laptop I could just relax and enjoy my surroundings. If I could ignore those things in trees! 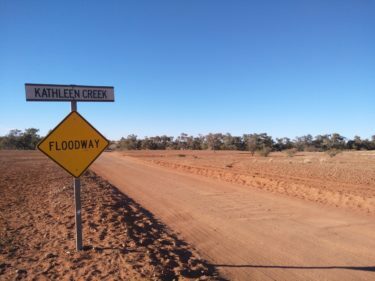 Runs from Maree at the bottom of Lake Eyre to Marla on the Stuart Highway (or vice versa if you’re travelling north to south). Attractions: Great Southern Railway (old Ghan) ruins and history. The railway history is in the Maree to Oodnadatta section. North of Oodnadatta there is no railway history, but some beautiful creeks to camp beside. Oodnadatta has a museum, the Pink Roadhouse, and the Transcontinental Hotel which are all worth a look. 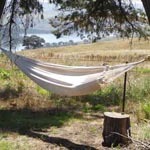 Cost: Free camping at creeks and other places along the Track. 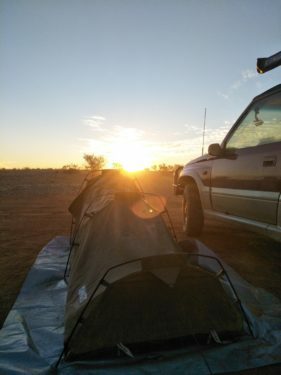 Paid camping, with showers and toilets, at Coward Springs, William Creek, and Oodnadatta. Camping at the Marree Pub is free, with a gold coin donation for showers. Road: You can probably do the track in a 2WD, but I wouldn’t recommend it. 4WD or AWD gives you better traction on the gravel and stony sections. 2WD vehicles really aren’t made for the corrugations you will get on this track.